Cilebra means camel tooth in the Tuareg language in Niger. 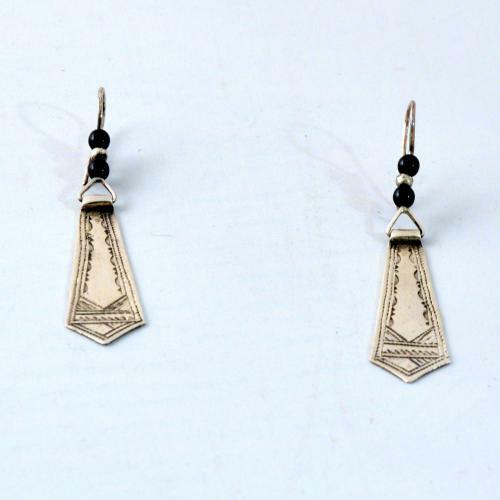 The two lines around the earring pendants represent the trail of the caravan in the desert sand. At the lower edge of the earrings, the hatched areas represent dunes blown away by the wind. At the top of the earrings you can see the tracks of the caravans, snake traces in the desert, and traces of caravans, blown away by the wind. Above, the striped areas are bounded by an arc, are waves that the wind has made in the sand. The triangles between these areas are further snake traces. Earrings full of stories, symbolism and mysticism.